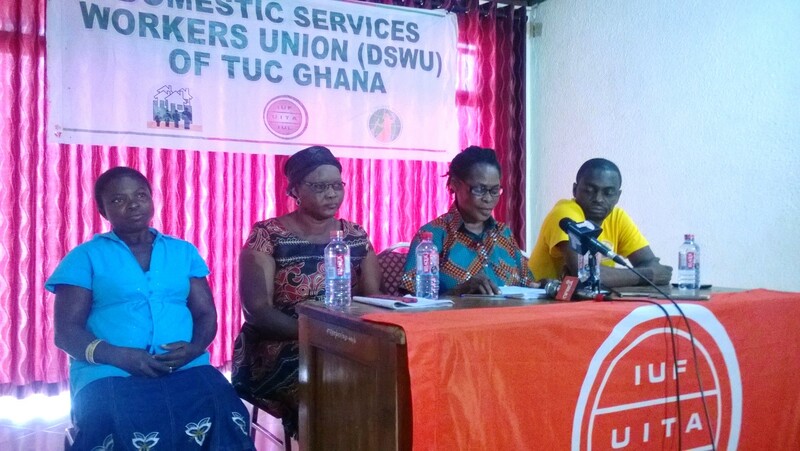 The Domestic Services Workers Union (DSWU) of TUC Ghana has used the commemoration of its second anniversary to call on the government of Ghana to pass the promulgated Labour (Domestic Workers) Regulations Bill 2016. According to the Union, government must make do with its 2017 budget statement that the bill would be passed by Parliament this year. Addressing the media at the Accra Technical University, Accra, on Monday September 25 2017, Sister Esther Kosi, General Secretary, DSWU, urged the Ghana government to pass the Regulations to facilitate the observation of the rights of domestic workers in the country. Twenty (20) DSWU members comprising 12 (twelve) women and eight (8) men, as well as 16 pressmen made up of four women and 12 men, from nine (9) media houses, attended the press conference. The press conference also called for ratification of C189, exposed some of the experiential issues of domestic workers to the press, and created platform for media interaction. Last year saw the birth of the Labour (Domestic Workers) Regulation Bill 2016, which was signed by Hon. Iddrisu Haruna, former Minister of Employment and Labour Relations for presentation to Parliament to pass through the required processes into law. 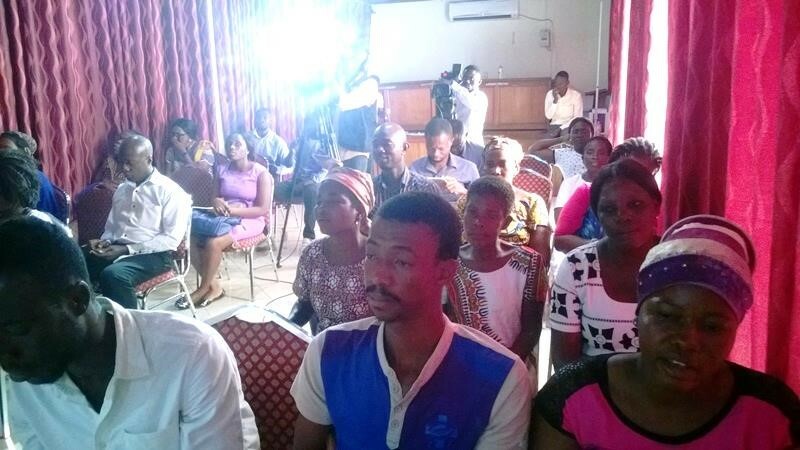 The bill, which was expected to have been passed before the end of the Sixth Parliament, was a demonstration of the commitment of the government of Ghana to protect the interests of domestic workers. The union recommended that government heed to the call to ratify ILO Convention 189 on Decent Work for Domestic Workers, and that passing the Regulation into law and ratifying the ILO C189 would be upholding Article 24(1) of the Fourth Republic Constitution of 1992 which provides the overall framework for conditions of work for workers in Ghana. The DSWU General Secretary pointed out that migrant domestic workers are caught at the crossroads of origin and destination countries’ policies and regulations that govern entry of foreign workers and their insertion into the labour market, as well as their employment and labour protection. The union therefore recommended that the Regulations should cover migrant domestic workers in Ghana so that their issues and challenges are addressed by the law. She emphasized that domestic workers are very crucial in balancing the economic basket of Ghana, and together with global brothers and sisters, they keep the global economic machinery moving throughout the whole wide world by enabling domestic employers to create economic activities outside the household. The union pleaded with districts, municipals and metropolitan assemblies to create conducive policies for the realization of the rights of domestic workers. Sister Esther assured that as the union moves into the future, it shall continually uphold the rights of all domestic workers in Ghana, and therefore welcomed all domestic workers in the country to join the DSWU. As one of the latest unions to join the ranks of workers movement in Ghana, the DSWU is working with the International ILO C189 on Decent Work for Domestic Workers, adopted on June 16, 2011, with its Recommendation 201 (which provides guidelines for implementation of the Convention). The DSWU came into existence on the back of the C189 and was officially outdoored with a founding conference in 2015. Over the two-year period of existence as a union, the DSWU has been supported by the International Domestic Workers Federation and the IUF with a number of activities such as campaigns, lobbying government for the adoption of ILO C189, trainings, awareness raising on domestic workers’ rights, recruitment and organizing, observing international domestic workers day, among others. The union has the prime task of building a strong leadership that is democratic and accountable to its members, with the objective of educating, training, organizing, and recruiting more members, among others, to demand and defend their rights. On the occasion of the DSWU’s second anniversary, the union was thankful to its partners such as LAWA, TUC Ghana, UNIWA, GAWU, ICU, NetRight, ILO, IDWF and IUF; as well as Labour Department, the Ministry of Employment & Labour Relations, and the Ministry of Gender, Children & Social Protection. The Union was particularly grateful to Sister Adwoa Sakyi, the IUF Regional Women’s Project Coordinator, who has devoted much of her time to domestic workers’ issues, and as well acknowledged the Chief Labour Officer for his immense advice and support.